We are members of the Suffolk beach hut association and we can be found on the website, also the magazine. Our staff are happy to travel in Norfolk, Essex and Suffolk to conduct work on your hut. We are also certified tradesman by the Suffolk County Council Approved Trader Scheme. Felixstowe Beach Hut with new hinges and new paint. The wind and sea salt can severely damage beach huts, due to their location. The hinges and locks can rust quickly and the woodwork can quickly develop rot, due again to constant harsh conditions. 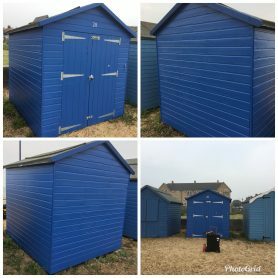 We have noticed that the occasional upkeep of the beach hut is required to maintain it, especially given that the council reserve the right to police the condition of the beach huts and can issue warning letters. This is part of the beach hut owners contract. We can help with all of your needs, especially when it out of season, such as winter and they need extra protection. On a personal note, I own a beach hut on the Felixstowe coast and it is a wonderful sanctuary to visit during my days off. It is a valuable asset worth thousands of pounds which can be very costly, if allowed to deteriorate. The roof obviously is a prime area of concern. Beach Hut Security is a prime concern for all owners. We offer a service to place additional security on the doors and any other access points, such as heavy duty locks and bars. It is also no good having a good lock if the frame that the lock secures to is week or rotten. We can inspect the whole security setup and can advise upon upgrading or fixing existing arrangements to protect your hut. Due to the harsh environmental conditions that your beach hut experiences, the timber exterior needs keeping in excellent condition to prevent rot and water damage. Parkley Building Services recommends using oil based paints such as the Cuprinol range to coat the hut. Painted and maintained regularly, your beach hut will resist rot and damage from rain and the sea salt. Please contact us for a fixed price quote. We can also decorate the interior of your hut if desired. We can provide you with a free structural report for your beach hut which will assess the condition of the timbers, the roof covering and joists, the cladding and the paintwork. This is a free report and any advice given can be acted on or not as you wish.